David Bloomgarden is the acting chief of the Multilateral Investment Fund's Access to Basic Services and Green Growth Unit and leads its public-private partnerships program. Previously, David was deputy director of the Office of Multilateral Development Banks in the U.S. Treasury Department. Adidas, one of the world's top two sportswear manufacturers, recently ended its business relationship with 13 of its Asian suppliers as a result of their severe or repeated noncompliance with labor, health and safety workplace standards at their factories. This is one example of large multinational corporations working harder to demonstrate to their ever-more-demanding stakeholders that they operate sustainably. As a result, companies' sustainability strategies are increasingly directly relevant to their operations -- and are resulting in positive financial returns. An analysis of S&P 500 companies confirmed that businesses that have built sustainability into their core strategies achieve financial profitability that is significantly higher than that of their laggard peers -- by between 18 percent and 67 percent. So what aspects should multinational corporations focus on to address increasing stakeholder pressures and improve their operational sustainability? One important area is the management of natural resources and environmental impacts, both in the corporations' own operations and also in their "value chains" -- the whole series of corporate activities that create and build value at every step. Small and medium-sized enterprises, which make up a substantial part of these value chains, are a major source of both natural resource consumption (inputs into production processes, such as water usage), as well as environmental impacts (outputs from production processes, such as greenhouse gas emissions). the value chain's share of environmental impact -- as compared with the corporation's share -- ranged from just over 50 percent (for the commodity chemicals sector), to more than 90 percent. 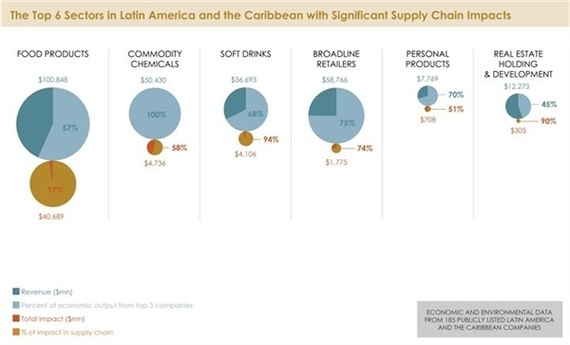 For instance, in the case of the soft drinks sector, the value chains are responsible for 94 percent of the environmental impact, and the corporations are responsible for only 6 percent. once the value chain is understood and its reporting standards are agreed upon, corporations can work with their small business suppliers to take corrective steps. For example, the food products sector can use sustainable certification labels such as RSPO (Roundtable on Sustainable Palm Oil) or RSB (Roundtable on Sustainable Biomaterials). corporations can use environmental preferred purchasing programs that seek to procure goods and services that minimize their environmental impact. This can apply to all stages of a value chain, from acquisition of raw materials, to manufacturing, distribution, or disposal. Very encouragingly, several companies in Latin America and the Caribbean are actively implementing and promoting some of these tools and mechanisms. For instance, Brazilian personal products company Natura integrates its suppliers into all of its sustainability activities, from mapping its water footprint, to purchasing raw materials from RSPO-certified supplier plantations. Furthermore, retail giant Wal-Mart Stores Inc. -- acting through its Walmex operational arm in Mexico and Central America -- has established codes of conducts for its suppliers, offered training programs for smaller businesses and disclosed the carbon emissions from both its own and its suppliers' operations. Michael Hofmann is a green-growth expert at the Multilateral Investment Fund who works at the intersection of the public and private sectors on the issues of innovative climate change and corporate sustainability business models, value chains, regulatory mechanisms and financial instruments.